We recently had the opportunity to talk with Larry Weber, the Executive Director of Keep Brevard Beautiful. KBB is an incredible organization. Created in 1981, it has managed, directed and initiated a wide array of programs and have enlisted the help of thousands of our residents. From education and partnership with Brevard’s schools, to Adopt-A-Road and Adopt-A-Shore, to continual clean-ups Larry and his teams efforts have a profound impact. They work tirelessly behind the scenes at many events, such as the Cocoa Beach Area of Commerce’s annual SeaFest celebration, to ensure litter-free events. Keep Brevard Beautiful has several programs that deal with landscaping, xeriscaping and beautification. They do much more than pick up trash. They sponsor recycling education and awareness, help plant trees in our parks, and notices when your business improves your property with its recognition program. And they work to get rid of non-native plants, like the notorious Brazilian Pepper, that invade and displace beneficial plants. When we discovered the scope and reach it has, and the impact they make in Brevard, we just had to connect with Larry and help spread the word. The future in Brevard County will see more success in developing the 3 R’s, Reduce, Reuse, and Recycle, so that there are active everyday efforts to recycle, reduce waste and produce and purchase products made from recycled materials. Further, we see more citizens taking personal responsibility for the trash they generate by doing such things as cleaning up their yards, maintaining their landscapes, and joining efforts to pick up liter on Brevard County shorelines, roadsides, and neighborhoods. Keep Brevard Beautiful, Inc. challenges our community to be conscious of their role in perpetuating litter. KBB offers many opportunities to join organized community enhancing activities, such as the annual Trash Bash, which is held county-wide on the third Saturday in April. In the next few years people who enjoy outdoor events will expect clean, safe events due to the Litter Free events sponsored by KBB. The behavioral norm of littering at outdoor events will be replaced with responsible behavior. The Keep Brevard Beautiful, Inc. vision for the future of our community is a more educated citizenry regarding the value of native plants in landscaping plans and the need for land management to sustain natural resources. We also see recognition by our public leaders to make progress toward eradicating non-native invasive plants, thereby protecting native habitats and biodiversity of both native plants and animals. Finally, we see future progress toward consensus between government, law enforcement and the public, to enact ordinances and legislation for landscape practices, signage and litter prevention and control, to manage the precious natural resources of Brevard County, to sustain our ecosystems, and control the effects of storm water run-off. Keep Brevard Beautiful works to sustain the quality of life in Brevard County. We see wonderful people who care about the future of our community. We see our county recognizing the need for action to protect our natural resources, reduce waste, and control litter. Although there will continue to be huge influxes of people, and the pressure to use land for roads, houses and shopping, will still be a part of our county, we will have deep dedication from strong leaders who want to keep Brevard beautiful. What is the most troubling thing you see happening in our county? 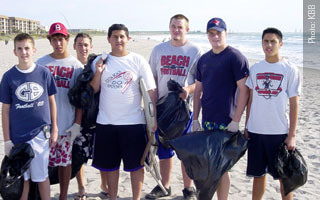 As we strive to educate our community about the need for personal responsibility regarding waste, and the need for environmental sound landscape practices, we are constantly playing “catch up.” When new people come to Brevard County, they do not have a sense of “ownership.” They have no “community pride.”’ Therefore, the trend is to use resources instead of protecting them. As community spirit grows, more people begin to see the need for conservation. With “ownership” comes pride. So, we feel challenges to motivate and educate more people all the time. 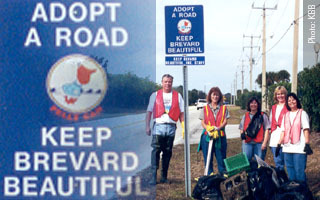 Keep Brevard Beautiful will continue to challenge our community to take positive action to protect our quality of life. We do this through education programs and community enhancing events. We will work with partners to include every sector of our community in the efforts to reach as many people as possible. volunteers who participate in the mission of Keep Brevard Beautiful show how important teamwork is, allowing us to accomplished so much more, together. 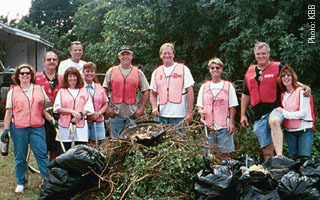 In 2004 volunteers performed 597 cleanups, picking up more than 330,000 pounds of ugly trash from our roadsides, shorelines and neighborhoods! This action demonstrates community pride. Clean communities inspire more positive action, with more people getting involved. We hope to reach more and more people so that community pride is found everywhere in Brevard County. Sustaining the beauty of Brevard County is the passion that motivates Keep Brevard Beautiful, Inc. The stunning beaches, fabulous rivers, diversity of plants and animals make our county a paradise. People use this paradise to live, work and play. It is vital to bring people into the role of stewards of our community so that more people care for such issues as Florida Friendly landscape practices, clean safe beaches, and litter free neighborhoods. People from every sector of life in Brevard County can take personal responsibility to keep our county beautiful. By joining the KBB team, working together, we will keep Brevard beautiful! If you could change one aspect of Brevard County, what would it be? We would change the “somebody will do it” attitude and turn that around to “let’s do it together.” Looking for opportunities to take responsible action gets the job done. Waiting around for somebody else to accomplish a solution is a waste of time. Brevard County needs more “can do” attitude. What prevents Brevard County from being all it can be? Lack of consensus on what to do causes slow action. Our county needs an overall comprehensive plan that is adopted by all municipalities and Brevard County government, for land management that protects our beaches and natural resources. We need leadership who has vision and the ability to bring consensus. Often there is plenty of talk, an abundance of ideas and opinions about what should be done to manage our resources. Meanwhile, action that is taken lacks coordination and planning toward a common goal. To keep Brevard beautiful, we need an action plan, and we need to follow through. The natural beauty and the people who want to see this beauty sustained. Some communities have beautiful beaches, but Brevard County has beautiful beaches, a large selection of protected natural habitats, which serve to enrich our environment, and we have the Kennedy Space Center. We have a melting pot of people from all over the world. These people have a special responsibility to protect the special quality of Brevard County. Keep Brevard Beautiful membership is full of people who know the value of action, and who make a commitment to encourage others to join us.